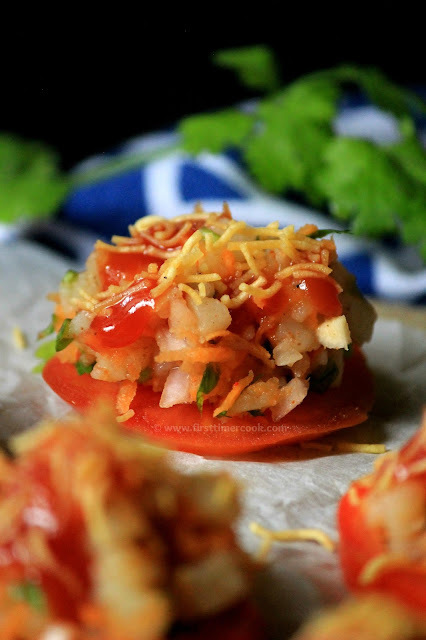 Chaat is a savory snack, typically served at road-side tracks from stalls in India. Basically the chaat variants are all based on fried dough, with various other ingredients. The original chaat is a mixture of potato pieces, crisp fried bread / dahi vada / dahi bhalla, gram or chickpeas, tangy-salty spices, with some Indian chutney, fresh coriander leaves and finally yogurt for garnish. But nowadays, there are a huge variety of chaats available in market which include golgappa chaat, bhel puri, dahi puri, sprouted moong chaat, panipuri, dahi vada, papri chaat etc. 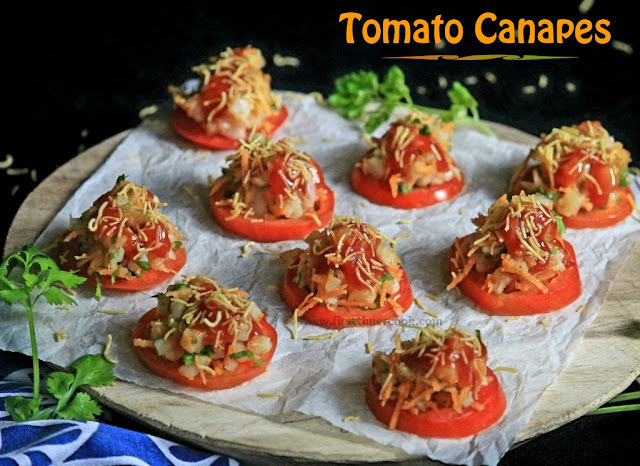 Today I have come up with a recipe, tomato chaat or tomato canape where the tomatoes are used as a base. Well, tomatoes are loaded with many health benefits. Tomatoes are a treasure when it comes to their antioxidant benefits due to the high concentration of lycopene. Lycopene is a carotenoid pigment which is related to red tomatoes. In terms of conventional antioxidants tomatoes provide an excellent amount of vitamin C and beta-carotene, a very good amount of the mineral manganese and a good amount of vitamin E. Hence tomatoes keep your health in good shape as well as help in preventing several diseases like prevent several types of cancer, maintain strong bones, good for skin, good for digestion, reduce risk of heart disease, improve vision and many more too. In fact, these are incredibly versatile and can also be prepared in a variety of dishes, as well as being great to eat alone. 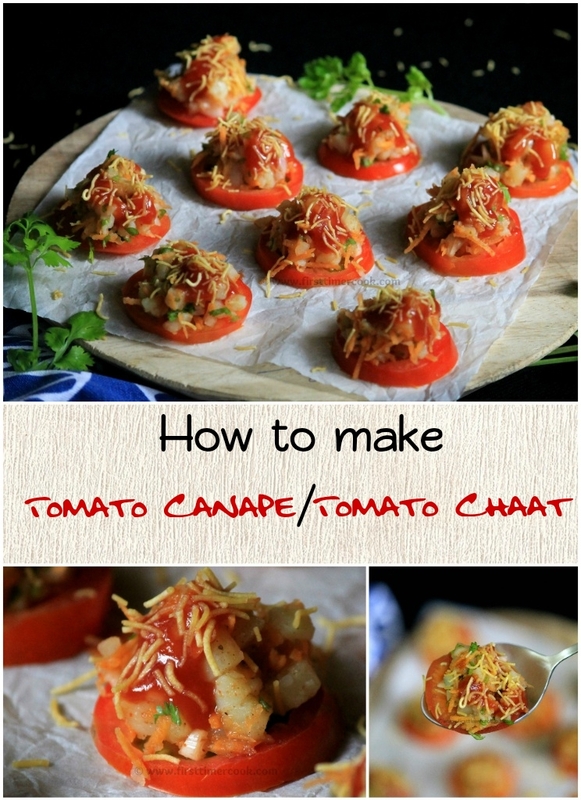 Tomato canapes or tomato chaats are so easy to assemble and ready to serve in few minutes. Since I had run out of mint chutney, so used lime juice. Grated beetroot can also be added here for toppings. These healthy canapes can be used as kids snack, a great party appetizer. So lets go in details. Wash and clean all tomatoes properly. Cut the tomatoes in thin slices and keep aside. Next in a mixing bowl, take chopped boiled potatoes, grated carrot, chopped onion, chopped coriander, red chili powder and salt. Gently mix everything well and keep aside. Now take a serving platter and arrange the tomato slices. Place 1 tbsp of the potato-carrot mixture on each slice. 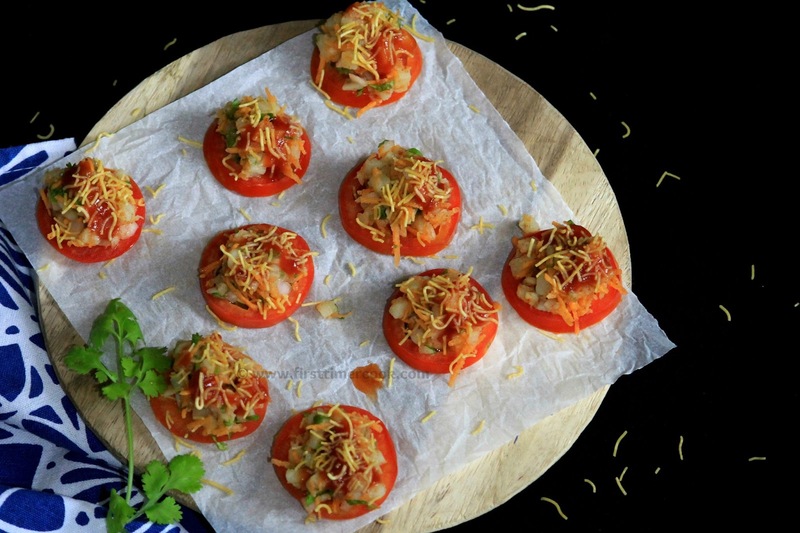 Then top with tamarind chutney, lime juice and finally sprinkle some sev and chopped mint leaves on each tomato slice. 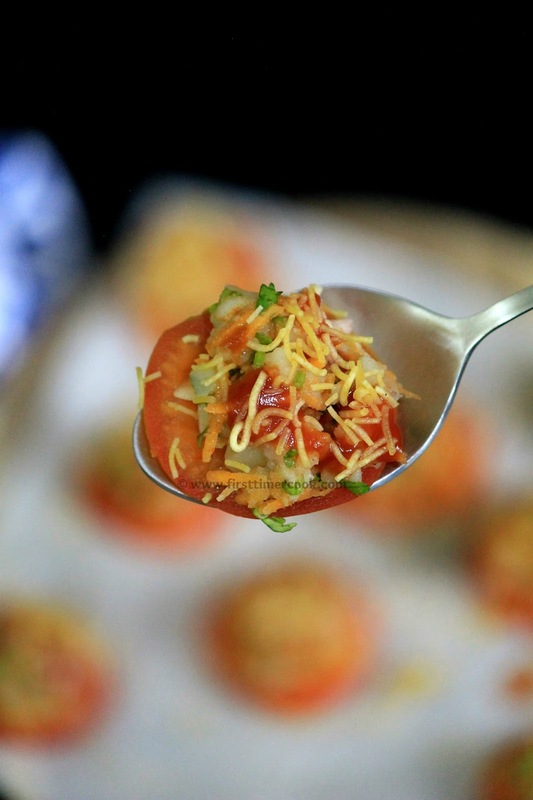 Serve immediately and enjoy these healthy tomato canapes ! Mint chutney can be used instead of lime juice. I had run out of mint chutney, so used lime juice. There is no big difference in taste for both. 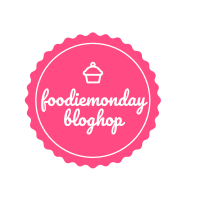 This tomato canapes recipe is contributed for 107th Foodie Monday Blog Hop where the theme is #PartyDishes. What a healthy AND delicious party snack! Want to stuff them all in my mouth! yumm! Easy and delicious recipe. Loved it. Something to make with the abundance of tomatoes! Thanks! This sounds delicious. My kids would get a kick out of eating these, they love tomatoes! A healthy and yet a chatpata starter. Love this recipe and will surely try it out soon. Great recipe for party food theme. 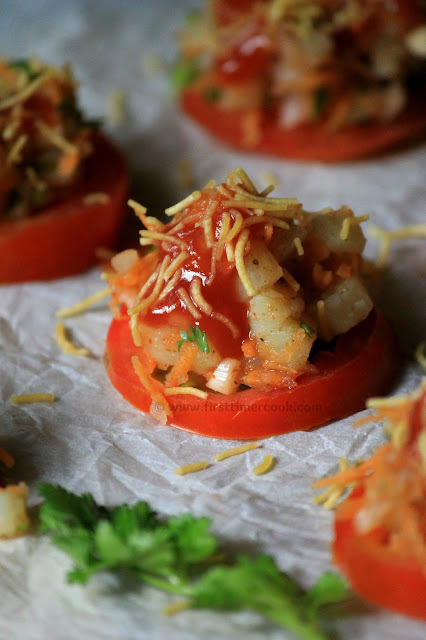 What a beautiful idea to serve chaat...Vibrant and healthy. Fab idea to serve Chaats. Too tempting! !